Happy Friday! It was a busy work week, and I can't believe we're in the middle of September already! But...just as I am moving along with the bracelet, I suddenly realized that this Sunday was the Beading Babes reveal day and I put that aside so that some other projects cut in line to be finished first!!! Yikes - I have a bit more to do on this one!! So I know now how I'll be spending my Friday night and weekend!! Here is a free pattern for use for the Bead-It-Forward quilt project for 2013! Jackson looks like he is have a wonderful time on his boogie board. 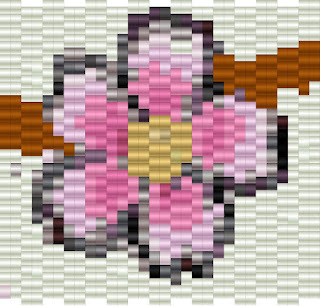 I am in the middle of finishing another Retro Daisy bracelet I did not like how the first one came out, but will show the picture of it anyway. I will want to try the soutache also. Well I got to get back to the grind stone. Looking forward to seeing what you did on Sunday. Oh, I envy Jackson in that water! I love the South Jersey shore! I haven't participated in the Beading Babes this time. None of the projects really caught my eye and I would have done the Retro Daisy bracelet but I ran out of time! Same old story!! Thanks for all the free patterns. I love this one. The water looks delicious!!! :D My creative muse appears to be taking some time off with several projects half completed! Hoping it comes back this week. Jackson looks soooooooo happy! Not to worry my friend I am farther behind on Beading Babes than you and in fact I will not be able to participate this time around. I can't wait to see your finished piece!